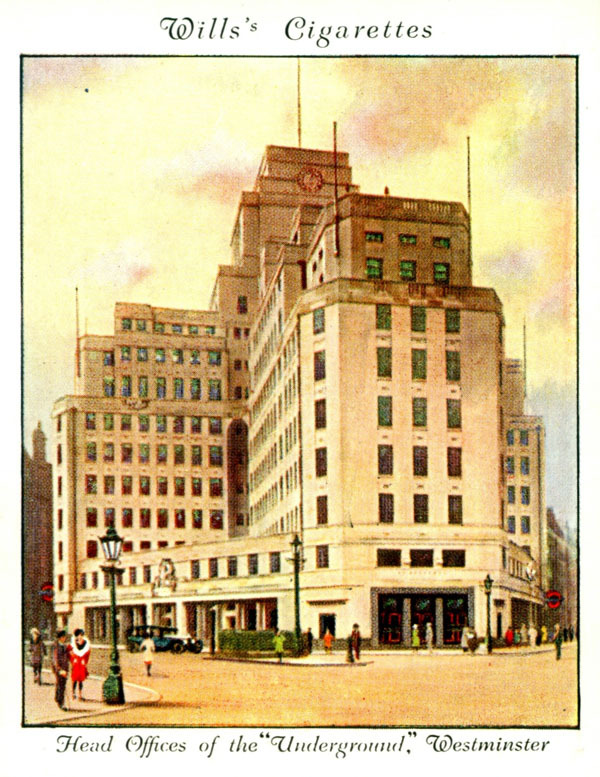 Charles Holden’s central London masterpiece is this building for the Underground Group from 1927-29. Holden adopted an unusual cruciform shape to make best use of the awkward site. The cruciform design afforded the optimum level of natural light to the offices. The whole building straddles St. James’s Park tube station, the east and west wings being immediately above the railway tunnel. At the time this was London’s tallest secular building with 10 occupied storeys rising to 13 at flagpole level. It broke the then London Building Acts that regulated the heights of buildings in the city. On each elevation, above the sixth floor, is a relief sculpture, collectively known as ‘the four winds’, although the four points of the compass are repeated twice for a total of eight reliefs. Each relief was carved by an avant-garde sculptor of the day – including Jacob Epstein, Henry Moore and Eric Gill. It was first listed as Grade II in 1970 and re-graded to Grade I in 2011.